What could be more fun than this? A family of undercover superheroes, while trying to live the quiet suburban life, are forced into action to save the world. Come watch a fun and free family movie and support UC Del Sol Girls Softball. 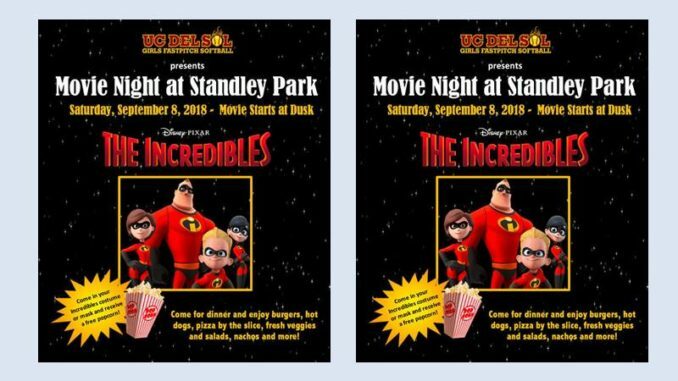 Snacks will be available for purchase; dress in your Incredibles costume to receive a FREE popcorn. On Saturday, September 8, at Standley Community Park, 3585 Governor Drive, in University City. The pre-movie fun begins at 5:30 PM; the movie will start 15 minutes after sunset. Park on the street or in Swanson Pool or Recreation Center parking lots. Movie will be shown east of pool on the grass. For more information, contact the Standley Park Recreation Center staff at 858-552-1652.